There it is, all planted up, my 21st vegetable garden. I've learned a lot since I planted my first vegetable garden back in 1987. A lot. But there are times I still feel like there is a lot more to learn. And there are times when I feel like ignoring what I've learned and trying something different. 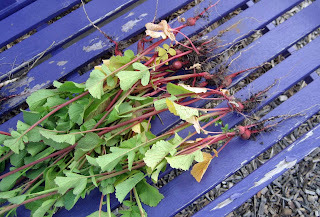 This year I went against all I was taught about crop rotation and spread everything throughout the garden. No more do I have a bed of peppers, they are spread out over four different beds. Tomatoes? I have fourteen varieties and I think they are in six different beds. I spread the eggplant out in several beds, too. And there are squash hills from one end of the garden to the other. Yes, I know that for crop rotation, this is not good. But I'm doing it anyway. It's too late to stop me or try to talk me out of it. I've planted. We'll see how it goes. Already I've figured out that this doesn't make it very easy to put row covers over some crops to keep the rabbits out, so instead of doing that, I've sprinkled everthing with ground cayenne pepper. I'm sure the rabbits were laughing when the wind switched directions on me and I got a face full of that cayenne pepper. My, that does burn your eyes. What got me really going this morning and out early to finish up the vegetable garden planting was the threat of rain. 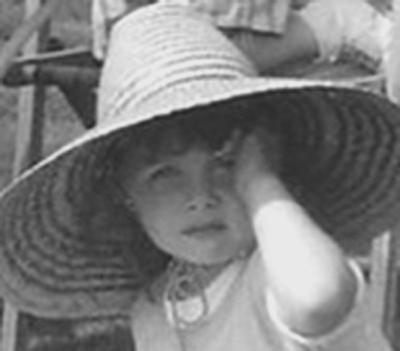 Turns out, I do better, as do many people, when I feel like there is no more time and IT HAS TO BE DONE. Get out of the way! Grab the hoes and get to gardening! And I did. I worked steadily in the garden for nearly six hours planting vegetables, annuals, perennials and a few shrubs. I only stopped because we had a brief shower and after looking at the weather radar, I thought the rain might go on for awhile. But it didn't, so I quit unnecessarily before I was done, and I still have a few things to plant after work this week. In between planting, I took breaks and photographed the peonies. I could have sat there and looked at them all day but I had work to do! No time! And I could post 50 pictures of them this evening, but you don't have that much time either. Or do you? If you do, let me know, I have dozens of peony pictures I could share. When I wasn't looking at the peonies, I was very busy in the vegetable garden. I had to pull these 'German Giant' radishes because they had "bolted' and sent up flower stalks. They never did form good roots. But I don't think it is a problem with this variety, I think I planted them at that wrong time. The moon phase was all wrong for root crops the day I planted them, as it turns out. Just to see if that was really the reason, I'm going to try sowing seeds for this variety again on a day the almanac says is good for below ground crops, which is the 27th, 28th or 29th of May. By the way, I didn't pay attention to the almanac when I planted today. The above ground crops should next be planted on June 5th or 6th, according to the almanac, but I didn't want to wait that long. We'll see what happens. If I have total crop failures, at I least have a good excuse. I am pleased to report that there won't be a crop failure of the strawberries. If the bunnies will stop nesting in the strawberries, I think I'll have a bumper crop. I'll have the "good problem" of having too many strawberries. But I'll deal with it. I'm sure I can give some away or learn how to make strawberry jam. "Never count your strawberries before they ripen". The garden looks great! Once again, it seems as though you are in a different zone. My peony buds are still tightly closed. I can't wait to see those fabulous blooms. We didn't get much rain here at all today, I was hoping we would since I had just planted some things yesterday. I had to water. It doesn't hurt to break the rules once in a while. Good shot of that great Purple bench. You should have lots of berries.Mmmm! Supposedly raccoons don't like the prickly stems of squashes so people plant them as deterrent groundcovers....maybe if you have them spread out all over the gardens the rabbits would also find them distasteful? Don't just take time to look at the peonies, Carol - take time to smell them, too! 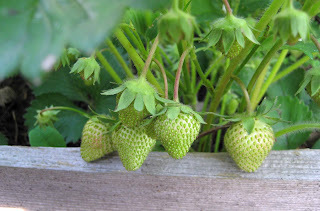 I'm eagerly anticipating my strawberries too--and I swear I will get them before the birds start sampling them this year! My peonies are still buds, but your photo there (and, no, there isn't any such thing as too many peony photos, so bring them on, if the mood strikes you) gives me plenty to look forward to. I have different plants spread all over my garden, too. I've never had a problem growing that way, although I don't have the problem with rabbits that you do. I like Annie's squash suggestion--I hadn't heard that one before! Your strawberries look great, Carol. Keep us posted on mixing up your plantings. We did a little of that, but not to the extent that you have. When I read the title to your post I envisioned you counting each strawberry as you popped it into your mouth. Ha.. A little early for that I see. It won't be long though. Maybe spreading out your crops will deter insects etc they won't know just where to look for their favorites and some will survive. There is a new blogger in town...(in Nashville, i.e.) 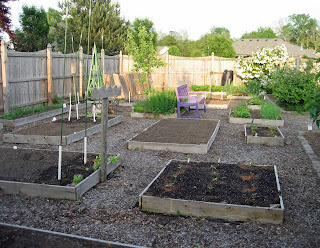 who is Square Foot Gardening...of which I know very little...but that strikes me as gardening quite intensely in close quarters...How different is that from your rotation method? BTW,your garden looks wonderful and you can show me all the peony photos you have...I love them. Seems like your "stay-cation" was time well spent. You got a lot done. I agree with you about peony gazing. I just returned from doing the same thing myself. It's too bad they don't last longer though. Carol, Carol, Carol, you are a gift. I've missed visiting you. "Yes, I know that for crop rotation, this is not good. But I'm doing it anyway. It's too late to stop me or try to talk me out of it. I've planted." That's what I like about you. Are you a Taurus, by any chance? Mary in NC who is in a gardening fever with her brown thumb. So neat and tidy and full of promise! I just read in 'Mother Earth News' that if you put a length of old hose in your garden the rabbits think it is a snake and stay away. Might be worth a try. Now I am craving strawberries! Robin's Nesting Place, I had to water, too. And I do have a another peony that is still just buds, so it could be your variety is just slower to bloom. Curtis, Some say rules are meant to be broken, but it takes an effort for me to break rules! 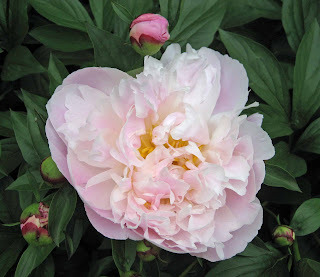 Annie in Austin, I did indeed take time to smell the peonies and write a post about them. Hail, the Peony! And so far, the rabbits haven't found my peppers or tomatoes to eat them off! Maybe I have confused them. Colleen, So far, I haven't had problems with birds in the strawberries, but you never know, I might need to put a netting over them. And with your kind permission I posted a lot of peony photos this evening! Sherry at the Zoo, Regular updates on the garden are planned! Lisa at Greenbow, Yes, I had considered that maybe I wouldn't have whole crops wiped out by insects, by spreading them out. And the strawberries are a little late this year. Last year at this time I had picked at least one. Gail, I hope you enjoy my peony post. My garden is loosely based on Square Foot gardening methods. I don't always space the plants as recommended, but close. Nicole, Too late, I threw the radish tops into the compost bin. I didn't know they were edible. Robin(Bumblebee), True, peonies don't last long, but they make up for it with a grand show. Anneliese, I agree, there is plenty of room in the blogosphere for more than one strawberry post. I hope you don't get a freeze tonight, too! Mary, mary, mary, you make me feel good with your comments. I am not a Taurus, I am an Aquarius. Layanee, I tried the hose trick and it didn't work. I don't think the rabbits were fooled for one minute. I read somewhere that I should go to a toy store and buy a realistic fake snake! I'm going to try strawberries again next year but get them started sooner and protect them with row covers against the frost. I've also planted my raised beds in the mix-and-match method, mostly because I'm hoping that diversity will keep a pest from knocking out a whole crop. If my squash plants are in different beds, maybe some of them will get hit and others wont. I'm also mixing in herbs and marigolds which I've read can also help with pest prevention and attract pollinators.